The National Medal of Arts is an award and title created by the United States Congress in 1984, for the purpose of honoring artists and patrons of the arts. A prestigious American honor, it is the highest honor given to artists and arts patrons by the United States government. Nominations are submitted to the National Council on the Arts, the advisory committee of the National Endowment for the Arts, who then submits its recommendations to the White House for the President of the United States to award. The medal was designed for the NEA by sculptor Robert Graham. 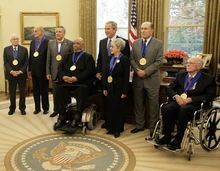 In 1983, prior to the official establishment of the National Medal of Arts, through the President's Committee on the Arts and Humanities, President Ronald Reagan awarded a medal to artists and arts patrons. 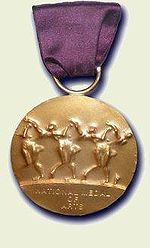 The National Medal of Arts was first awarded in 1985. It was most recently awarded in 2015. In 1989, composer and conductor, Leonard Bernstein refused his award, allegedly due to how a federal grant to an art show on AIDS had been revoked. In 1992, musical theatre composer and lyricist Stephen Sondheim refused his award, on account of believing that the NEA had "become a victim of its own and others' political infighting and is rapidly being transformed into a conduit and a symbol of censorship and repression rather than encouragement and support." In 1997, poet Adrienne Rich refused her award as a protest against “inconsistencies” between art and “the cynical politics” of the Clinton administration. ^ "National Endowment for the Arts 2018 Guide" (PDF). National Endowment for the Arts. Retrieved 29 November 2018. ^ a b "National Medal of Arts by Year". National Endowment for the Arts. Retrieved 29 November 2018. ^ "Leonard Bernstein Refuses The National Medal of Arts"
^ STEPHEN SONDHEIM, the Tony Award-winning lyricist and composer, has turned down the 1992 National Medal of Arts award administered by the National Endowment for the Arts. 1984 establishments in Washington, D.C. This page was last edited on 29 November 2018, at 21:08 (UTC).